Shirts With Random Triangles: Former USC running back Ty Issac to transfer to Michigan in in the fall. Former USC running back Ty Issac to transfer to Michigan in in the fall. Ty Issac. Photo via Bleacher Report. Ty Isaac is taking his talents to Ann Arbor. 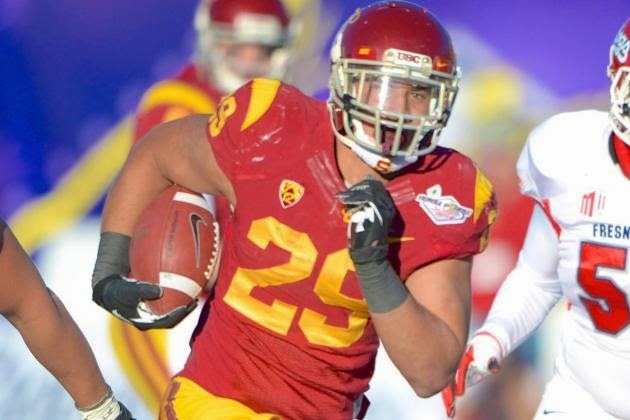 The former USC running back announced on Twitter Thursday afternoon that he is transferring to Michigan in the fall. A native of Joliet, Illinois, Isaac decided to transfer to be closer to his mother, who is dealing with medical issues. Issac says he chose Michigan over Illinois due to his being more familiar with members of the Michigan coaching staff. Isaac will seek a hardship exemption from the NCAA to avoid sitting out the 2014 season because of the transfer.